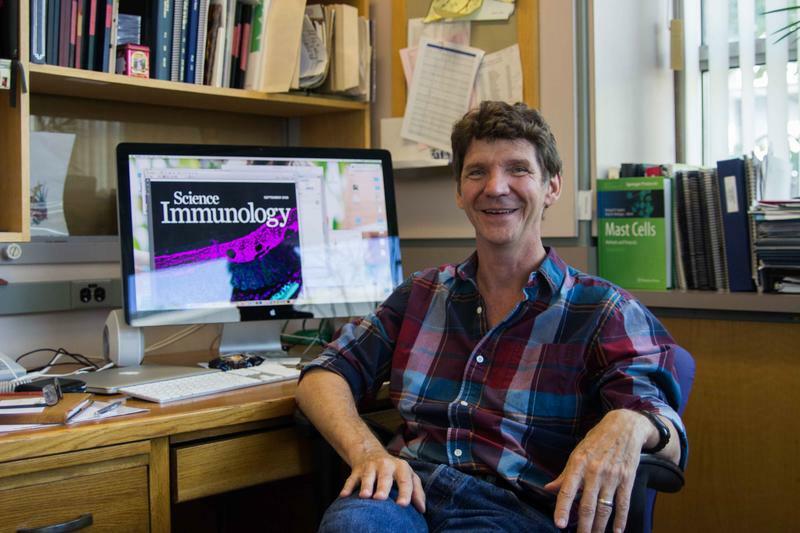 McNagny in his lab in the Biomedical Research Centre where he was, until recently, a co-director of the centre. McNagny stepped down to focus on research. Have you heard of Crohn's disease? Probably. Do you know what is is? Probably not. Crohn’s disease is one of those diseases everyone’s heard about, but no one can explain. This is surprising because about one in every 150 Canadians lives with Crohn’s or colitis (inflammation of the lining of the colon) — a rate that’s one of the highest in the world. Crohn's is a chronic inflammatory disease that can cause diarrhea, bleeding, malnutrition and possibly other affects in organs like the eyes, liver and joints. UBC researcher Kelly McNagny, a professor of medical genetics, and Bernard Lo, a PhD student, found that in mice, it may be possible to treat Crohn's disease without weakening the immune systems like current therapies do. If you think of your bowels as an elastic sewer pipe, Crohn’s disease is when the pipe walls get thicker and thicker due to inflammation — similar to how your finger gets red and sore when you get a paper cut infected. Crohn’s also makes the your gut less elastic, basically turning your bowels into scar tissue. Not only can this prevent food and waste from traveling through your bowels, it can also make it harder for the bowels’ to soak up nutrients and fluids. All of this can cause pain, vomiting and diarrhea — or worse. In Crohn’s disease, inflammation can lead to the build up of extracellular proteins and molecules — called a matrix — that build a thick complex outside of the cell. This mess of proteins outside the cell can act as a barrier, preventing things from getting to or from the cell which makes it very hard for cells to do their job. It's not a problem you want in your bowels. Currently, Crohn’s is treated with drugs that turn down the intensity of your body's immune response. The problem is the drugs turn down the entire immune system, leaving patients prone to infections. What McNagny's research suggests is that it might be possible to turn down just the part of the immune system involved turning gut tissue into scar tissue. Lo and McNagny found a protein — ROR-alpha — that is active in the gut's immune cells that help turn on the genes that make the matrix grow out of control. The team also found ROR-alpha requires a second molecule to become active, meaning if the team could block the second molecule, they could shut down the matrix production and prevent the scarring in Crohn’s disease that lies at the root of it. With mice, they are currently testing a molecule that might be able to do just that. Understanding ROR-alpha — this "on-switch" protein for gut scar-tissue formation — is so exciting because turning it off could prevent scar-tissue from forming in Crohn's patients without affecting how the immune system responds elsewhere. Mice with non-functioning ROR-alpha had normal immune response. While mice are far from a perfect model for Crohn’s disease and the research remains years away from reaching the clinic, it could have far-reaching affects. “I would argue fibrotic disease is what kills everyone if you don’t die from cancer or get hit by a bus or die from infection. As you age — liver, kidney, muscle — all of these organs degenerate and replace normal healthy tissue with fibrotic tissues, basically scar [tissue],” explained McNagny. The team thinks that if they can turn off ROR-alpha, the “on-switch” protein in humans, they could prevent scar tissue from not only forming in the gut because of Crohn’s disease, but also around the body in healthy people. The research may translate into humans especially quickly because there are already clinical trials of treatments that target proteins switched on by ROR-alpha — albeit for psoriasis, an autoimmune disease. There had been a trial of the same drug for treating Crohn’s disease in humans which had limited success, but it targeted Crohn’s patients without severe scarring — the very patients that should benefit the most according to the research. The research offers new hope in improved treatments for Crohn's if research into it continues. McNagny said that funding for his labs — and others across Canada — is hard to come by. His lab, which only a few years ago had a team of 12, can now only support five researchers. “Where we are struggling now, is it’s getting very hard to get funding for research in Canada,” McNagny said. “We are stretched to the bone."